“For example, when our town needed us to moderate a town council candidate forum, we were there. In turn, we are able to get participation and support when needed. Recently, when our club needed a letter of recommendation for a grant application, our state representative pulled over to the side of the road to take our call. That kind of positive response is due to the efforts of hundreds of wonderful women over the past 46 years. It is our mission to always honor that history and build upon it,” said Club President Suzanne Carswell. Suzanne says picking a favorite club project is a bit like having to pick a favorite child. Top projects include a Butterfly Garden, Pink Ribbon of Hope, White Bags of Courage, Crafts for Kids with Cancer, First Responder Appreciation, and Free the Girls bras for international victims of human trafficking. “I have lots of favorites for different reasons. A simple 8’ tall pink ribbon at our little town’s major intersection reminding women to get screened was wonderful, as was delivering 100 bags of art supplies to children undergoing cancer treatment at Columbia’s children’s hospital and the 38 bags of candy along with a poem we delivered over the holidays to thank our First Responders,” she said. The club awards approximately $20,000 per year in grants and college scholarships. Members are advocates for local schools and support education with monetary donations, snacks for after school programs, tutoring, and mentoring. 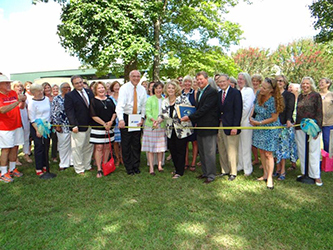 Last year, the club’s butterfly garden was dedicated at a local park and is having a wonderful impact on the entire community. Both the elderly in the adjacent senior center and youth in scout troops and classroom field trips are enjoying the garden. Learn more about the Chapin Woman’s Club by visiting www.chapinwomansclub.com. To find a GFWC club in your area, click here.